Artist’s rendering of Dawn with Vesta (left) and Ceres (right). Distances, scale and the number of asteroids in close proximity are greatly exaggerated. 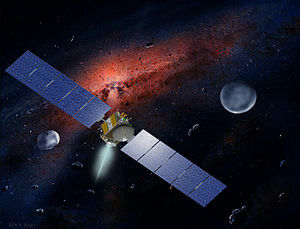 In the first of two NASA missions to arrive at a Dwarf Planet this year NASA’s Dawn Spacecraft, which previously visited the asteroid Vesta, successfully inserted itself into orbit. First launched in 2007, the spacecraft uses three Xenon Ion Thrusters for propulsion. After launch it traveled to the asteroid Vesta where is spent 14 months orbiting and studying it. Once complete it then being it’s journey to Ceres which was successfully completed today with an orbital period of 15 days. Dawn will gradually move closer over the coming months until it arrives at it primary science orbit. Unfortunately we won’t be able to see any images just yet as the craft arrived on the side facing away from the sun. The spacecraft is the first to orbit two extraterrestrial bodies and once the mission is complete will most likely become a perpetual satellite of Ceres due to its stable orbit. There was a plan for Dawn to potentially perform a flyby of another asteroid Pallas however that is no longer possible because the remaining fuel on the vehicle will be used at Ceres due to hardware failures on the spacecraft. For more news on Dawn check out the mission page here. Below are some of the images that Dawn has already returned from Ceres, these will only get better over the coming months as the spacecraft moves closer to it’s final orbit.